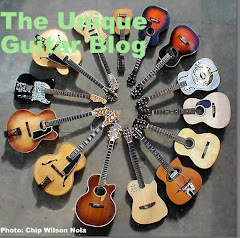 One of the most popular guitars owned by top guitarists is perhaps one of the most unheard of guitars. Mark Farner owned several of these guitars. So did Mark Bolan, Greg Allman, Johnny Winter, Eric Clapton, Ace Frehley, Todd Rundgren, Ronnie Montrose, Robbie Krieger, Jeff Lynne and many other top performers. This guitar has built up its following and reputation solely by word of mouth. John Veleno worked as a master machinist and manufacturing engineer. Veleno's expertise lay in designing and routing out a billet of aluminum for use as a chassis for electrical components used in the aerospace and computer industries. Veleno was a member of The American Society of Tool and Manufacturing Engineers. He had also designed parts for the first mainframe computer systems used in large businesses such as banks. During the 1950’s Veleno had worked in a few Rock bands and taught guitar at several music stores. He had a love for the guitar, but it was only a hobby. Veleno also gave guitar lessons out of his home. 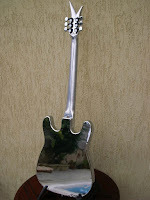 To promote teaching guitar, he built an aluminum guitar shaped mailbox. In the early 1960’, one of his friends complimented him and told him the mailbox would make a great guitar. That was when an idea took place. Veleno made a highly polished aluminum guitar by using a 17-pound billet of the metal. 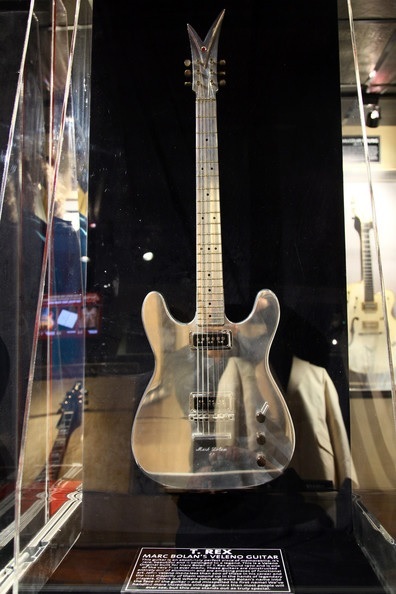 Not only was the body made of carved aluminum, the neck and headstock were all aluminum as well. John Veleno created his first instrument as a sideline, with no thoughts of going into business. An acquaintance with some connections suggested that he could get John backstage at a James Gang concert. He suggested that John should sit backstage, polish his guitar, and wait for some of the guitar players to take notice and inquire about this unusual guitar. No one took notice. He went to see Santana and the results were better. Santana used his guitar on stage, but did not like the six-on-a-side tuners or the bird-shaped headstock. Although he didn't buy John's guitar, he suggested that a few changes be made to the guitar. Veleno went home and reworked the design, changing the headstock to a Vee shape with three-on-a-side tuners. He struck gold at a T-Rex concert. Guitarist Mark Bolan took immediate notice. He played the instrument and ordered two guitars on the spot. Bolan kept one, but sent the other to Eric Clapton as a gift. 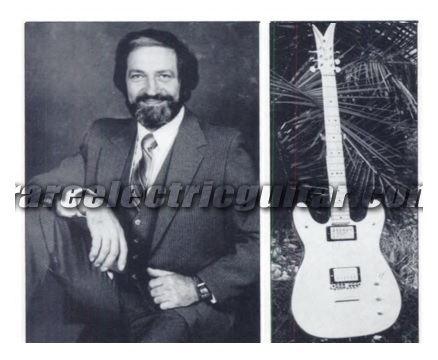 After that, many other well-known players sought out John Veleno guitars. Veleno’s engineering skill aided him in creating an instrument with a neck that would never warp, which was fretted to within a 1/1000th of an inch. This allowed it to be refretted as often as necessary. The neck was made of cast aluminum, while the body was carved from a billet of aluminum. The minute tolerances he worked with made this instrument one of the most tonality accurate guitars ever made. Not to mention the polished mirror finish on this instrument was stunning. 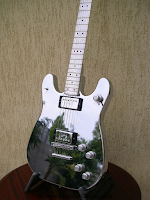 One of the advantages of the Veleno guitar due to the aluminum body was that it is completely grounded from external or internal electrical interference. The fretboard had a radius of 11”, which aids in preventing fret buzzing. The electrical harness was made in one-piece helps for easy repairs. Because the neck was aluminum, there was no need for a truss rod. Veleno used pickups from other manufacturers, such as DeArmond, Guild, Gibson or EMG. The Gibson pickups have more of an edge and grit. The Guild and DeArmond pickups have a cleaner sound. He had originally used bridges manufactured by Guild or Gibson before going on to create his own guitar bridge and tailpiece. Outside companies manufactured the guitars tuners. The guitar’s electronics consisted of a tone and volume control for each of its twin pickups, a three-way pickup selector switch, a phase switch and a coil tap switch. Veleno’s engineering background played into all aspects of his guitars design. He was not concerned just about the guitars outward looks, but the best way to get the best sound for his invention. He consulted electrical engineers that worked for Bell Laboratory. They advised him single strand wiring was preferred for phone transmission over multi-strand because it produced a cleaner sound and tone. Bell engineers had experimented with both and the single wire method was superior. The downside of this method of wiring is a slight delay in the transmission of the signal. The good news is that it is the delay is so infinitesimal it is almost indictable to human ears. However, it provides the clear glassy tone associated with Veleno guitars. 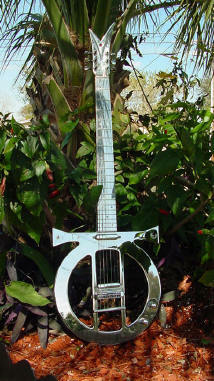 Perhaps the most unusual Veleno guitars are the ones ordered by Todd Rundgren. These consisted of a set of three ankh shaped guitars and an ankh shaped bass for Rundgren’s stage show. One of the ankh guitars was destroyed in a warehouse fire. 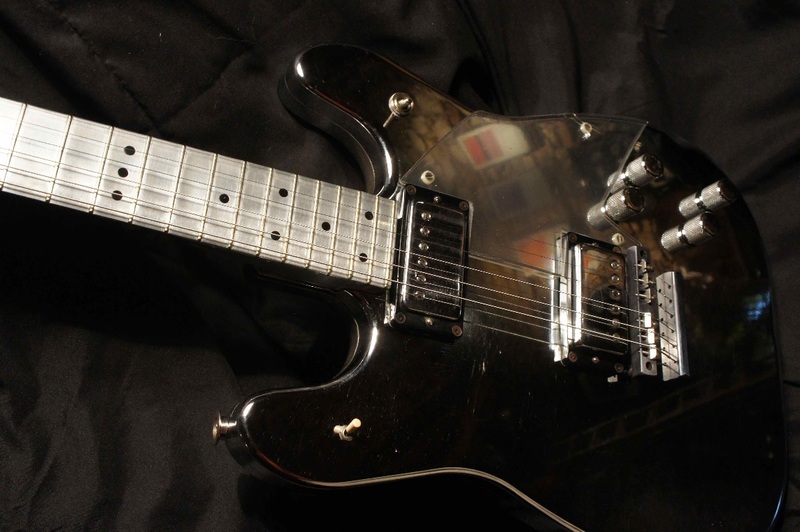 The only other specialty guitar was built for Pete Haycock of the Climax Blues Band. It had a gold finish. Veleno experimented with different types of aluminum until finally settling on 6061 grade because it did not discolor. After carving the bodies shaped out of aluminum billets, many of the bodies were then chrome plated. Others were anodized with red, green, blue, or gold finishes. 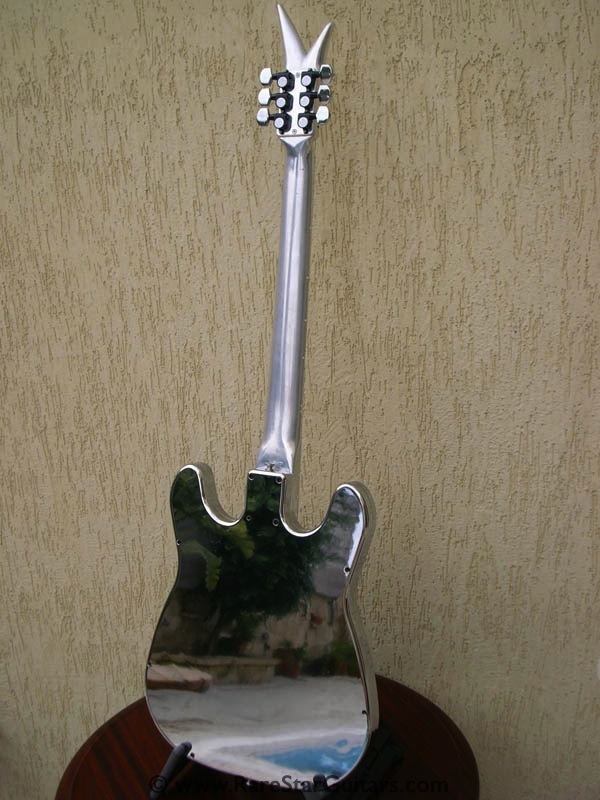 The necks were made of cast aluminum, which included a fretboard that was either chrome plated or black plated. The first the necks had 21 frets. There is no label on the Vee headstock. 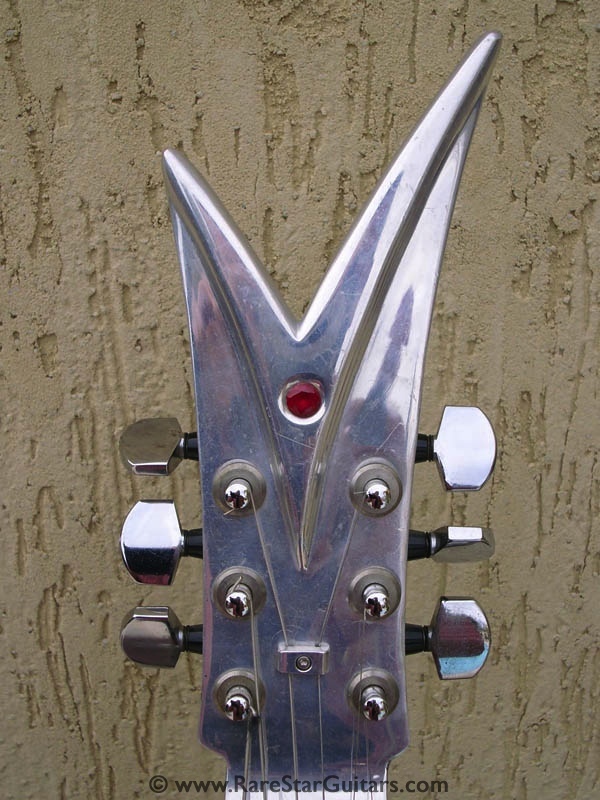 Each headstock is adorned with a ruby. The weight of the Veleno Original guitar is around eight and a quarter pounds. With the exception of the ankh guitar, Veleno only produced two versions of his guitars. I have described the original model. The other style was a traveler-sized instrument. The Veleno Originals weighed about eight and a quarter pounds. When John Veleno approached B.B. King with his guitar, the Blues Boy was not interested, but said, he would be interested in a travel-sized instrument. Veleno came up with the Veleno Travel guitar. This instrument has a total length of 27 1/4" and is 8 1/2" wide. It came with 24 frets. This allowed the player two full octaves per string. Only about 10 Travelers have been built to date. In 1976, after creating nearly 200 Veleno guitars, John Veleno suffered two strokes, which left him paralyzed for a short time and unable to work. John’s son Chris Veleno stepped into to help by assembling left over bodies, necks, and parts. Chris also continued with repairs for players that had contracted for warranty work. At present, Chris has produced around 20 instruments, using his fathers method. John Veleno is alive and well. The Veleno family is currently selling new production guitars and basses. The price tag is rather high. The Original retails for $8,995. The Ankh model retails for $13,995. They do take direct orders on line at a discounted price. Unlike some manufacturers, John Veleno has never given away guitars in exchange for promotion. Veleno guitar are quite rare, because his clientele were all major artists who have held on to their Velenos, it is unusual to see one for sale. When one does come up for sale, the price varies from ten to twenty thousand US dollars. Very cool article. Thanks for interesting content. You are correct sir! Cool video, great song and nice Veleno. No doubt veleno's look cool. But metals that conduct electricity also expand and contract with slight temperature changes and with expansion/contraction, tuning will change - dramatically. Not cool when doing 40 minute sets with 20 minute breaks. You will need to retune after EVERY song for the first five songs of EVERY set. I used one exclusively for years, and performed over 3,000 gigs (yes, 3000). There are other issues with the guitar as well, and I would be happy to share if anyone's interested. You can also check my music if you doubt my credibility. Hit me back and we'll discuss. Although Veleno's have an impressive list of owners, ask yourself this; How many of those guitarists use Velenos as their primary guitar? interesting website and comments . just for the sake of accruacy "Mark" Bolan was actually known as "Marc", though his real name was Mark Feld. Anyone any idea how much this thing is worth? Follow our signals today & profit up to 270% per day.